Ed Schneider, 63, has grown french-fry-making spuds for 40 years outside of Pasco, Wash. He says in all his years of farming, he’s never seen planting be pushed this late. Most potato farmers have to dig on a contracted day to feed processors. The fertile fields in Washington and Oregon, are just now drying out from severe winter snows not seen for 100 years. And potato farmers like Schneider are a month behind in planting. A cool spring -- along with this late start -- could throw Schneider’s yields off 30 to 40 percent. “We need some warm,” he says. A irrigation pivot and field stands still on a spring day outside of Moses Lake. Potato farmers who grow as much as 70 percent of the nation’s French fries and processed potatoes are four weeks late in planting this year due to record winter weather. So if potatoes come out small because they haven’t had a full growing season, farmers don’t make as much money. This year, the late-planted spuds will likely weigh less -- and that dunks these spud farmers in hot oil. Losing up to 40 percent of their yields is a lot of risk. Schneider and other farmers put around $4,000 to $5,000 per acre into land rentals, seed, chemicals, fuel and crews. And many of those expenditures have already happened this year -- like renting the expensive fertile ground and signing growing contracts -- so spud farmers are locked in. And in this mild area of the country, few potato growers carry crop insurance for weather like this. Voigt says even a 20 percent loss in yields can do serious damage to a farmer’s business. One worry: That processors will start digging fields early, and then have to dig even more fields early because the tonnage will be light on all of them, causing a cascading effect of early dig days. Voigt says there aren’t a lot of extra potatoes from last year to fill in the gap. Many Midwest and Eastern states and even parts of Canada lost lots of potatoes last year thanks to freezing temperatures. So Northwest farmers shipped many of the extra potatoes they had from their last crop to those areas. And now those are gone. 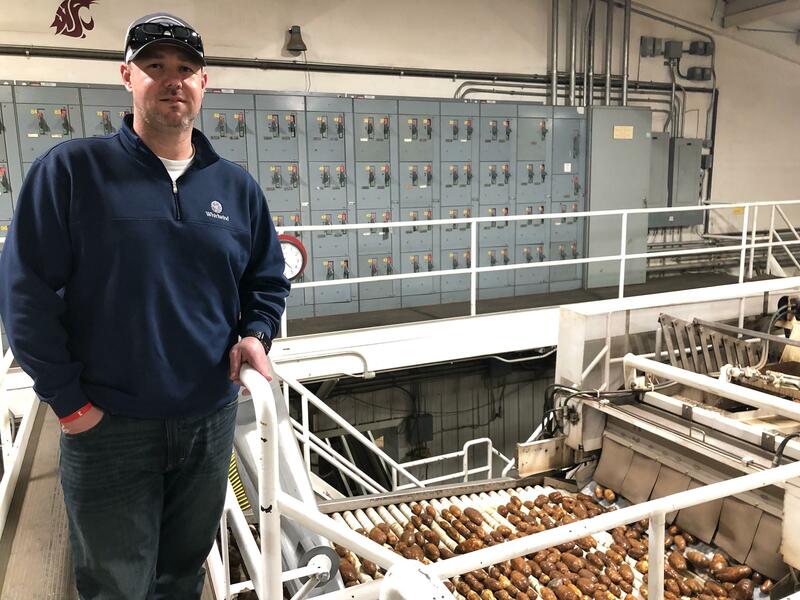 Jared Balcom, 45, is a fourth-generation potato farmer and packer in Pasco, Wash. He’s hoping a warm spring will help catch their crops up so they can meet their yields and set contracts with processing plants and fresh potato customers. Voigt says processors typically hold 34 days worth of frozen fries at the ready -- but by July those processors might start running low. Another problem for growers is that there might not be the trucks, tractors and work crews available to get three months work -- plowing, fertilizing and seeding -- done in just one month now. So just the bulk of work -- and a shortage of equipment -- might further delay planting. Potatoes scoot by on fast belts at Balcom & Moe in Pasco. The potatoes get a rinse, are sized and then put in bags destined for America’s supermarkets. The potato farmer and packer-shipper has been in business since the 1920’s. 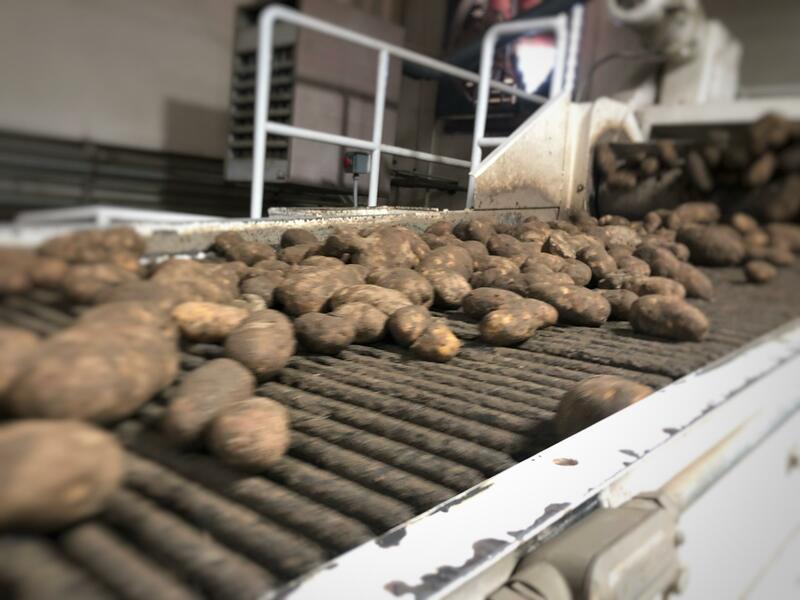 In downtown Pasco, potatoes bump along a belt -- where they are washed with dozens of sprayers, sized and bagged for supermarkets. Jared Balcom’s family has owned this potato farming and fresh-pack company in Pasco for four generations. With customers and contract deadlines the new crop just can’t be late. 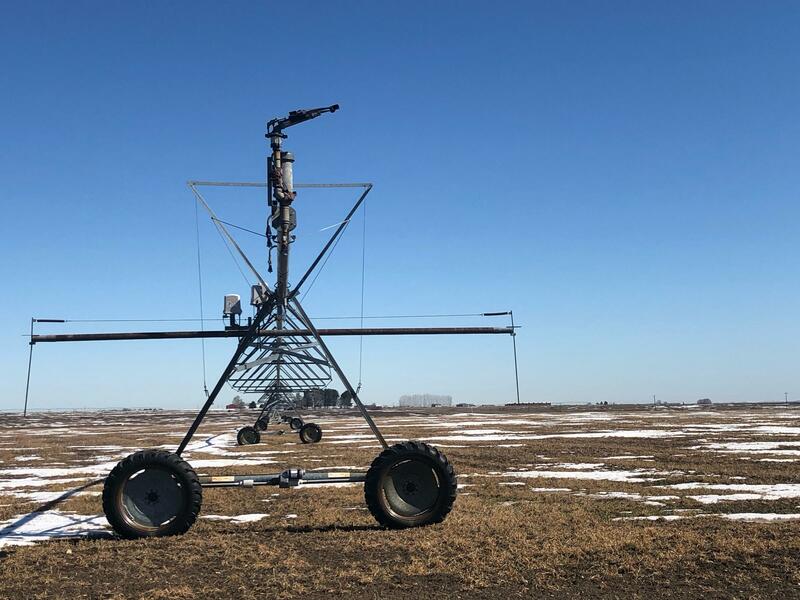 “We need to have a really nice spring and a really nice summer from Mother Nature to make sure our crop finishes out the way it’s supposed to,” Balcom says. Huge risk is a large part of a farmer’s job. But many potato farmers here say they’ve never seen planting start this late. With China threatening to slap the United States with tariffs on $3 billion worth of U.S. made products, one group that is worried is Washington state’s apple farmers.